Big winds reaching over 45kts has led to the retirement of over 20 yachts in the Rolex Middle Sea Race including the likes of Tom Hill’sTitan 12, Will Apold’sValkyrie, (CAN), Mick Cotter’sWhisper, (IRL) and Alberto Bolzan’sOurdream Damiani(GBR). Meanwhile out in front, stretching her lead and her chance of beating the current record time is George David’s supermaxiRambler. This water-ballasted, Reichel Pugh 90ft carbonfibre racing machine (formerlyAlfa Romeo) set off to a good start yesterday in the building 15-20kt breeze from Valletta enjoying a battle withTitan 12andLoki, as they headed northward up the coast of Malta towards Sicily. 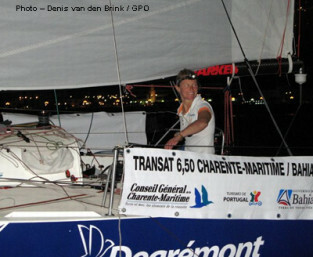 Thirty-six hours onRamblerand team with Ken Read as skipper has already rounded Sicily and is on her way back to Malta. In order to beat which is currently held by Robert McNeill’sZephyrus IVrecord (64 hours 49 minutes and 57 seconds in 2000) she must be home by 0400 on Tuesday 23 October. But as it currently stands the race office at the Royal Malta Yacht Club are predicting she’ll cross the line at around 0900 in the morning. Meanwhile Tom and Dotty Hill’s 75ftTitan 12with Peter Isler navigating took an interesting decision quit from the race yesterday while the going was good and arrived back at Grand Harbour Marina earlier today. Chatting from the dock about the reasons why they decided to retire, Isler told Yachting World: “There actually nothing wrong with the boat, she’s in great shape, but we thought better of the conditions. The race started a bit auspiciously for us because our jib came out of the feeder as we passed the first Rolex buoy soon after the start. But we have a really great crew onboard and effected recovery real quick. We were still up at the front of the fleet having a great race just behind Rambler and ahead of another pack of boats as we approached the Mdina Straits last night. However, at 10pm last night we took a look at the latest forecast and decided to be prudent and turn around. Andrew Calascione, co-skipper ofJamminsailing with John Ripard decided enough was enough 20 miles south of Reggio Calabria at about 0700 on Sunday. Interestingly,Jamminwas one of a number of yachts to encounter localised, but extreme conditions with a series of sharp rain squalls bringing violent winds that even led to them running at times under bare poles. Calascione commented: “we knew the forecast beyond the Strait was pretty bad. And, after encountering heavy squalls with thunder and up to 55-knots of wind we felt it foolhardy to continue through the Strait. Jamminis currently in Riposto withGeisha(MLT) andBordeaux 3(MLT). The crew hope to duck down to Syracuse on Monday and join the party developing there. Along withKerisma, a gaggle of Maltese have sought shelter there including Georges Bonello DuPuis’Primadonna, Sandro Musu’sAziza, Alfie Manduca’sGarmin Allegra, Lee Satariano’sArtie Goand Jost Merten’sEscape. Behind Rambler lieAtalanta II(ITA) andLoki(AUS). Shortly after rounding Stromboli this morning,Loki’sSkipper Cameron Miles and Navigator David Sampson reported to the race control the night’s entertainment which included a wipe out: “We were in close company withAtalantaandOurdreamall night,” said Sampson. “We encountered a lot of rain and low visibility. We’re wondering when we are going to see some of this scenery we have heard so much about,” he continued, adding “we’ve had some good running under spinnaker, assisted by positive current and exited the Straits this morning at about 0330 in 30kts of breeze. We regularly hit 20kts of boat speed on the way to Stromboli and expect to be in the low teens most of the way to western corner. The models are showing the wind bending around with us, but I don’t think those behind are going to have much fun.